Remember our good buddy Kaylan King? Kaylan is a huge Scotty fan. On May 21st Kaylan suffered a brain aneurysm and was in the hospital for a long time. Her biggest regret was missing her Scotty Concert at The Farm. We spoke to Scotty and his family about Kaylan and they invited her family to come to the show in Fayetteville to meet Scotty! Kaylan has a lot of healing to do still and could use everyone's prayers, but Friday night her mom tells us she was in great spirits! "THANK YOU THANK YOU FOR YOUR HELP IN GETTING KAYLAN TO THE SHOW AND MG!!!!!! SHE WAS ABLE TO STAY FOR THE ENTIRE SHOW!!!! AMAZING HOW NORMALCY & HAPPINESS CAN MAKE A DIFFERENCE. I COULD NOT CONTROL MY TEARS WHEN SCOTTY BEGAN SINGING "I LOVE YOU THIS BIG". I WAS SAD FOR KAYLAN THAT SHE COULD NOT GET UP AND SING AND HOLD UP A SIGN LIKE SHE DID LAST YEAR, THEN I LOOKED OVER AT HER AND SHE WAS SMILING AND WAVING HER RIGHT ARM...SHE IS TRULY AMAZING!!!!! WHEN SHE WENT BACK TO THE MEET AND GREET, THE MINUTE SHE SAW HIM SHE WAS ABLE TO SMILE THE MOST BEAUTIFUL SMILE!!! SHE GAVE HIM A K-KREW BRAIN ANUERYSM AWARENESS TSHIRT AND A PRAYERS FOR KAYLAN BRACELET AND HE ASKED HER IF HE COULD WEAR THE BRACELET DURING THE SHOW, WE NOTICED HE IS STILL WEARING IT IN ALL OF THE SHOWS EVEN IN PA AND NJ. HE CAME DOWN THE ISLE BEHIND HER SINGING WRITE YOUR # ON MY HAND....HE LEANED IN FOR A QUICK HUG, SHE WAS AMAZED. THIS TURNED OUT JUST AS I HOPED IT WOULD, KAYLAN FELT GOOD ABOUT HERSELF. SHE WOKE UP ON SATURDAY MORNING AND SPELLED TO ME THAT SHE WAS SAD-SHE MISSED SCOTTY...HAHA! To learn more about Kaylan you can visit her caringbridge page: http://www.caringbridge.org/visit/kaylanking. 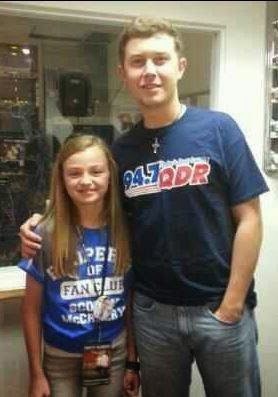 Special thanks to Scotty McCreery and his family. Scotty has touched so many lives...what a BLESSING he is to so many people in so many different ways. Kaylan you will be in my prayers. If anyone can cheer us up it is Scotty. He has had a huge impact on my life. He is just an amazing person as well as an artist. LOVE YOU SCOTTY!! 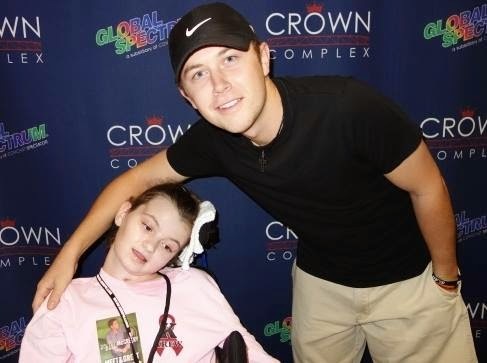 Scotty you are such a blessing to so many people and I am so glad Kaylan got to go to your concert and got to meet you and had a Good time. You made her feel so special and may God Bless her through her recovery knowing that. You have been there for so many people with your songs and the artist you have become is just Amazing. You have touched so many lives, including mine. May God Bless you each and everyday as you have blessed us. ILYTB Scotty. ..... Prayers for Kaylan!!! !